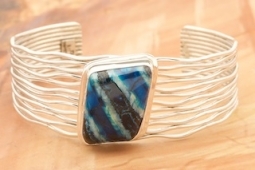 Genuine Ancient Mammoth Tooth set in Sterling Silver Bracelet. Created by Navajo Artist Murphy Platero. Signed by the artist. This Pendant features Ancient Mammoth Tooth. The mammoth roamed the Earth for 1.8 million years, until it's extinction about 10,000 years ago. Unearthed in Northern Alaska, Canada and Siberia, its unique colors are derived from minerals in the soil.